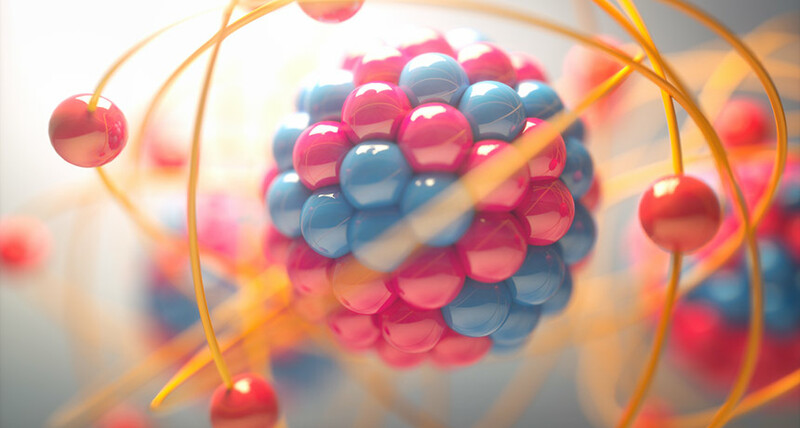 MASSIVE UNDERTAKING Using a technique called lattice QCD, scientists figured out how protons (illustrated here in the nucleus of an atom) get their mass. EmailPrintTwitterFacebookRedditGoogle+ SPONSOR MESSAGE A proton's mass is more just than the sum of its parts. And now scientists know just what accounts for the subatomic particle's heft. Protons are made up of even smaller particles called quarks, so you might expect that simply adding up the quarks' masses should give you the proton's mass. However, that sum is much too small to explain the proton's bulk. And new, detailed calculations show that only 9 percent of the proton's heft comes from the mass of constituent quarks. The rest of the proton's mass comes from complicated effects occurring inside the particle, researchers report in the Nov. 23 Physical Review Letters. Quarks get their masses from a process connected to the Higgs boson, an elementary particle first detected in 2012 (SN: 7/28/12, p. 5). But "the quark masses are tiny," says study coauthor and theoretical physicist Keh-Fei Liu of the University of Kentucky in Lexington. So, for protons, the Higgs explanation falls short. Instead, most of the proton's 938 million electron volts of mass is due to complexities of quantum chromodynamics, or QCD, the theory which accounts for the churning of particles within the proton. Making calculations with QCD is extremely difficult, so to study the proton's properties theoretically, scientists rely on a technique called lattice QCD, in which space and time are broken up into a grid, upon which the quarks reside. Using this technique, physicists had previously calculated the proton's mass (SN: 12/20/08, p. 13). But scientists hadn't divvied up where that mass comes from until now, says theoretical physicist Andre Walker-Loud of Lawrence Berkeley National Laboratory in California. "It's exciting because it's a sign that ... we've really hit this new era" in which lattice QCD can be used to better understand nuclear physics. In addition to the 9 percent of the proton's mass that comes from quarks' heft, 32 percent comes from the energy of the quarks zipping around inside the proton, Liu and colleagues found. (That's because energy and mass are two sides of the same coin, thanks to Einstein's famous equation, E=mc2.) Other occupants of the proton, massless particles called gluons that help hold quarks together, contribute another 36 percent via their energy. The remaining 23 percent arises due to quantum effects that occur when quarks and gluons interact in complicated ways within the proton. Those interactions cause QCD to flout a principle called scale invariance. In scale invariant theories, stretching or shrinking space and time makes no difference to the theories' results. Massive particles provide the theory with a scale, so when QCD defies scale invariance, protons also gain mass. The results of the study aren't surprising, says theoretical physicist Andreas Kronfeld of Fermilab in Batavia, Ill. Scientists have long suspected that the proton's mass was made up in this way. But, he says, "this kind of calculation replaces a belief with scientific knowledge."